know within 30 days to get a full refund! If you are thinking of writing a memoir or autobiography to share with your family and friends, we think you will love the Get it Done! 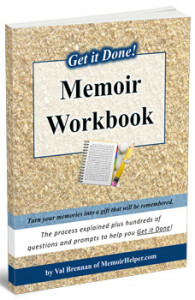 Memoir Workbook with hundreds of questions and prompts to help jog your memories. This workbook will reach even the far corners of your memory and will likely awaken memories you haven’t thought of for years. Sometimes the best way to get started is to just sit down and brainstorm. This workbook will definitely help with that process and has lots of space for writing your thoughts. You don’t have to be a professional writer to do this, just let go of the desire to be perfect and Get it Done! Get it today on Amazon.com. It is surprising what memories are uncovered by starting this process. Everyone should explore their past…good or bad…for self discovery. I can only do bits and pieces every once in a while but having the notes is good. Hi Paula! There is no wrong way to do it… bits and pieces or all at once. Good luck in your journey and let us know if there is anything we can do to help! That’s terrific Vic! So glad to hear that you’re enjoying the process. Thanks for letting me know. If you have any tips for MemoirHelper.com readers, please feel free to share them.